2012 Design Guide is Now Available! 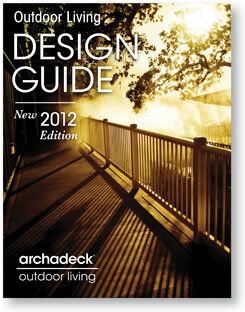 Archadeck's Design Guide will help you plan out your outdoor living space. How you will use the space? What views are important to you? How do you want your existing landscaping incorporated? Where in your yard will the project be built? What do you want to put on in your space? Answering questions like these will guide the design phase of your space. It will help you decide what you want to build whether it is a deck, porch, patio, pergola, gazebo, outdoor kitchen or a combination. If you are thinking about enhancing your outdoor living space, please download our design guide or contact your local Archadeck office. This entry was posted in Archadeck, Archadeck's Design guide, deck Design and tagged Archadeck Design Guide, Archadeck Outdoor Living, planning your outdoor living space by janegwalker. Bookmark the permalink.